In these two volumes we find more than 1,600 pages of letters and T.S. Eliot is not yet forty. The heroic task of getting Eliot’s writings properly assembled, edited, and annotated has begun in earnest: Christopher Ricks is doing the poems, Ronald Schuchard the prose, and Hugh Haughton has taken on the editing of the letters, begun by Valerie Eliot with the publication of a first volume in 1988 (now re-issued in revised form and with “some 200 new letters”). The letters, expertly and fully annotated by Haughton, tell a peculiar, driven, and somewhat ghastly tale, including (in the first volume) Eliot’s unsuccessful school days and his “loafing” through his first two years at Harvard; his increasing academic success, followed by a year in Paris and London; his progress toward a Harvard doctorate in philosophy, and his study of philosophy for a year at Oxford, with the expectation that he would (after defending his dissertation) join the philosophy department at Harvard; his repudiation of that academic future by staying in England, marrying Vivienne Haigh-Wood in 1915, and (encouraged by Ezra Pound, whom he had met in England) deciding that he would become a writer, while somehow making a living (teaching, which he disliked, gave way to employment at Lloyds Bank). Prufrock and Other Observations, published in 1917, was followed in 1922—after Eliot’s nervous collapse and treatment in Switzerland—by the English and American publication of The Waste Land, the work that in its cosmopolitan scope and haunting free verse changed the face of modern poetry. Now, in Volume Two, we can see Eliot founding his literary review The Criterion, and suffering, while also in part causing, the excruciating breakdown of his marriage (a terrible tale to be continued in future volumes). At the same time Eliot becomes, by his constant production of arresting prose (Homage to John Dryden, The Sacred Wood), the most impressive literary critic in England. His professional and social doings are tracked by the letters almost day by day, but his marital life—experienced under intolerable pressure—bursts through only sporadically and incoherently in the relatively few intimate letters here. 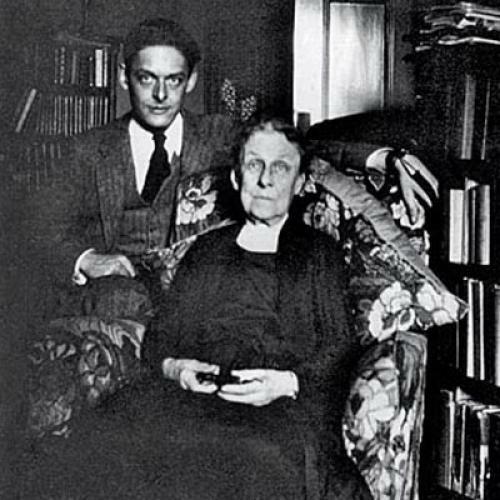 And intertwined with these narratives—the publication of poetry and prose, the management of The Criterion, the marriage, the social engagements with the Bloomsbury set and their wealthy friends—is the more intermittent narrative of Eliot’s relation with his family, especially with his mother Charlotte and his brother Henry, the two family members closest in sensibility to the poet. The most occluded narrative, perhaps naturally, is that of the genesis of the poems. It is frustrating to see Eliot writing to his mother in 1920, about The Waste Land, that “I want a period of tranquility to do a poem I have in mind”—and nothing more. These letters are not the place to search for the psychological origins of the poetry. To guess at those internal sources one needs to go to the early poems (edited by Christopher Ricks in 1996 under Eliot’s title Inventions of the March Hare) and to the facsimile edition of The Waste Land (edited by Valerie Eliot in 1971). When we stand back from the main narratives visible through the letters, we can view the entire improbability of Eliot’s life and art. His taking literary London by storm was hardly conceivable, given his beginnings. He was an introverted and high-strung young American from St. Louis, shy, virginal, and inexperienced in business; he had no independent income of a reliable sort; he had no ready-made London literary network; he worked from nine to five in a taxing bank position, dealing with international financial relations; he had no gift for addressing the general public. He did have Pound urging him on, but Pound soon fled London for Italy. What Eliot did possess—or was possessed by—was a nature driven not only toward the composition of poetry, but also toward an evangelism that would release modern poetry from convention without detaching it from tradition. Some have seen his evangelism as a will to power, exerted from the bastion of The Criterion; but Eliot primarily wanted the journal so that he could have a public role in the altering of taste. (He turned down the opportunity to be second-in-command to another editor.) Since he had no money, Eliot was always looking for patronage of a sort. The Criterion was financed by a rich society woman, Lilian Rothermere, who had heard of Eliot from his Harvard friend Scofield Thayer, the wealthy founder of the American literary magazine The Dial and the person through whom Eliot met Vivienne. Not only did Eliot not have money, he also could not entertain those members of society whom he wished to cultivate as backers: his wife was perpetually ill, and they lived in a succession of small flats. He depended, as conduits toward upper-class society, on Leonard and Virginia Woolf, who published his first poems and his first book of criticism, and on friends of theirs such as Ottoline Morrell, whose weekends at Garsington brought together the affluent and the gifted. It is nothing short of amazing that Eliot, while composing poetry and working full time, founded, edited, and perpetuated The Criterion (which was replaced by The New Criterion in 1925, after Eliot became a director of the firm of Faber and Gwyer, later Faber and Faber). It is hard to think of any other American poetic genius carrying off such a feat of organization, entreaty, direction, writing, coordination, and fund-raising. Not for nothing had Eliot grown up as the son of a businessman. Although his father died still thinking his son a failure, Eliot’s tenacious work on The Criterion suggests a will in the poet to prove himself competent in his father’s world of money and business. The Criterion correspondence, it must be said, is the most tedious part of the second volume of the Letters. In his search for contributors, Eliot “fawns [on] and flatters” (Virginia Woolf’s words, uttered in annoyance) author after author, in England and abroad, inviting them—in English, in fluent French, even in basic German—to submit work to his new journal, pleading with one writer to introduce him to another, finding channels through which to meet foreigners, imploring Hermann Hesse for a meeting, becoming depressed when he receives no answer from Proust (both Hesse and Proust eventually contributed), setting up exchanges with foreign literary journals, manipulating reviewers, offering payments, mediating quarrels, assembling number after number (always at the last minute), writing for the journal even as he edited it evenings in his flat, corresponding with the printer, reporting on his work to Pound and others. Nobody—unless engaged in a history of The Criterion—would willingly read all this correspondence in substantive detail. And reading it as an index of work hours is painful: all those hours taken from poetry. But the bank did not pay enough to live on and support a wife in any bourgeois fashion; and Eliot believed that the only way, in the long run, to gain a living wage as a writer was to find prestige through a journal. He actually thought of establishing a second journal (even while the first was exhausting him) which would be given a title such as Symposium or Cahiers, and would collect pieces by a number of authors on a common topic, but this idea never came to fruition. Although Eliot had distinct literary and political opinions, he did not wish the journal to be composed solely of essays, as many postwar journals tended to be: he wanted to print work by poets and novelists as well. Yet although the creative authors he printed by no means espoused a single point of view, over time the essays and commentaries in The Criterion took on a cast reflecting Eliot’s own political and religious sentiments. I think that your verse tends to diffuseness and to use of words of too general a meaning. Your poppy is not a definite poppy seen in a particular place or associated with particular circumstances and emotions. I think that you need to work the precise image. “Laughter like hot ashes in the throat” is not a very good comparison because one does not know what hot ashes in the throat are like and they do not suggest any kind of laughter. Eliot usually ended such a rejection letter with a mollifying remark, as he does here: “Later, I should very much like to see more of your work.” There were endless such letters to be written, a task requiring severity, delicacy, and prudence alike. To explain my sudden marriage to Vivienne Haigh-Wood would require a good many words, and yet the explanation would probably remain unintelligible.... I think that all I wanted of Vivienne was a flirtation or a mild affair: I was too shy and unpractised to achieve either with anybody.... To her the marriage brought no happiness ... to me, it brought the state of mind out of which came The Waste Land. The marriage was to prove the single most instructive event of Eliot’s emotional life. Before he married, his closest tie had been to his high-minded mother, to whom he wrote passionately devoted letters until her death. The youngest of seven children, born when his mother was forty-five, and growing up in a family of settled habits and emotional taciturnity, he fled from the Eliot constriction to the gaiety that he found dancing with Vivienne. Had her health, both physical and mental, held out, the marriage might have been somewhat less disastrous; but Eliot would perhaps have neglected any wife, given the intense demands of his will to write. As it was, however, the Eliots’ marriage ran into very bad luck. The letters reveal scarcely a day of their domestic doings which does not contain an account of illness. Although Eliot had a rational interest in religion that arose from his family roots in New England and his Harvard studies of both Christianity and Buddhism, he found himself addressing religion under duress from the despair of the marriage, and from his guilt for his part in its failure. His mother, after reading The Waste Land with considerable discomfort, wrote that “I would like him to supplement The Waste Land by its natural sequence [for “sequel”?] ‘The coming of the Grail.’” Charlotte Eliot herself wrote a dreary Browningesque verse drama on Savonarola, showing the preacher’s mother heartening her idealistic son. When he failed to place it with Knopf, Eliot paid to have it published by the printer for The Criterion, and wrote a foreword (in which his relation to the author went unmentioned) speculating that a new sort of verse drama would be the next modern literary feature. Years later, in writing Four Quartets, Eliot was at last fulfilling his mother’s desire that he should write of finding the Grail. And his (erroneous) prophecy of the importance of verse drama to the future of literature led to his own plays in verse, received respectfully but rarely resuscitated for the stage. The casual St. Louis anti-Semitism of Eliot’s mother (“I have an instinctive antipathy to Jews, just as I have to certain animals”) takes on, in the hysterical anxiety of those lines in “Gerontion,” the sinister tones of European anti-Semitism, in which Jews are the financial controllers of the world, squatting on hoards in Antwerp, Brussels, London. Stepping through Eliot’s repellent landscape one finds the occasional moss and flower, yes, but one encounters, too, rocks and iron and excrement under foot (and even the flower is called “stonecrop”). Que vous suivrez à peine ma piste. A Londres, un peu banquier. In America, he is a professor; in England, a journalist; in Yorkshire, a lecturer; in London, a banker; it will take many leaps and a quantity of sweat to follow his trail. Headpiece filled with straw, Alas! Of course the religious difficulty is the great one and it is impossible to tell what one’s solution will be.... One must be on guard against the prejudices of one’s training on the one hand and any emotional collapse on the other. I certainly do not want to fall into the pit of obscurantism. But one way or the other it will need an heroic effect [for “effort”?] to keep from allowing oneself illicit conclusions. The poet’s eventual decision—to convert to Anglicanism and to take a vow of celibacy—is not yet in view. In the implicit war for Eliot’s affections, his mother in the end prevails. Of all Eliot’s correspondents, his brother Henry (hitherto a vague figure in the public mind) comes off the best. Henry is the mediator between Eliot and his mother, carefully explaining the nature of “Tom’s” poems to her, putting them in their best light. He is a genius of tact, writing to his difficult brother with warmth and generosity. He even leaves his own typewriter behind after his visit to England, having silently noticed the broken-down machine on which his brother is depending. Henry has extraordinary self-knowledge and is an eloquent writer; his understanding of the Eliot family’s character—the reticence, the avoidance of all subjects concerning the body, the Puritanical rectitude—is helpful to his brother. In England, on their mother’s second visit, he provided a buffer between Vivienne and Charlotte. A thoroughly kind person, Henry advised his mother on her financial decisions and her will, all the while funneling money of his own to the impoverished Tom and Vivienne. They were, of course, not impoverished in an elemental sense: they kept a servant, they had a flat, Tom had a job. But they did not have middle-class comforts, or any financial cushion; Henry was a reassuring presence in their distress. In the last ten years—gradually but deliberately—I have made myself into a machine. I have done it deliberately—in order to endure, in order not to feel—but it has killed V.... Is it best to make oneself a machine, and kill them by not giving nourishment, or to be alive, and kill them by wanting something that one cannot get from that person? ... Must I kill her or kill myself? I have tried to kill myself—but only to make the machine which kills her.... I feel now that one cannot help another by ruining one’s own soul-I have done that. She became more and more frantic as time went on and took to making the most shocking faces and hypnotising herself. I can say no more of this; it is too horrible. I leave it to your imagination. I am sorry I tortured you and drove you mad. I had no notion until yesterday afternoon that I had done it. I have been simply raving mad.... Please write to this doctor instantly and tell him the truth, that we have had sexual relations. Do these things for me. Especially about our married life and make him see it had been good. All here believe not. Eliot is thirty-seven as the second of these volumes comes to a close in 1925. He lived until 1965, so there are many more volumes to come. Eventually, in 2019, the thousand restricted letters at Princeton written by Eliot to Emily Hale—the woman he loved, or thought he loved, in his youth—will be opened to scholars. Those letters will revise yet again our idea of the Eliot of these volumes. As for her letters to him, he burned them.